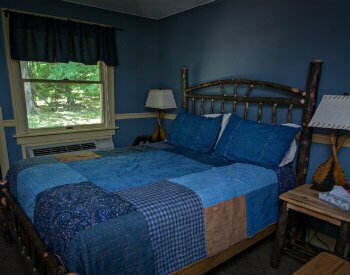 Stay in Hickory Hideaway, one of our Jacuzzi cabin suites, for your next vacation in the Poconos. 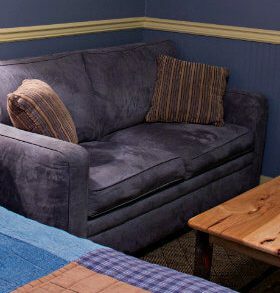 When you first enter Hickory Hideaway (Cabin Suite 4), you’ll notice a sitting area on your left with a comfortable denim couch and end table. Adjacent to the sitting area is a two-person Jacuzzi tub tucked into its own little glass block alcove. 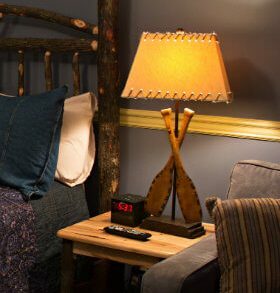 A queen-size bed constructed with twisted hickory branches and made up with Comphy brand linens allows you the perfect place to relax, whether you’re sleeping or catching up with your favorite show on the flat-screen television and DVD player. 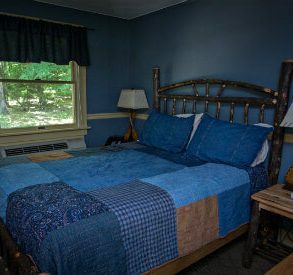 Simply shift your gaze to the north-facing window for a view of our wooded backyard. 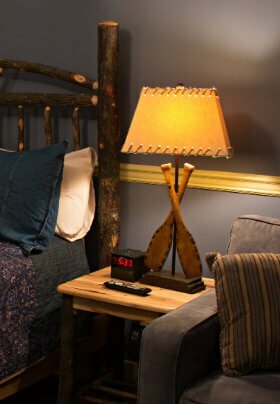 A gas fireplace is located near the foot of the bed and offers a warming glow to the room. There is also a mini refrigerator for snacks and beverages and an individual heating/air conditioning unit. The cozy private bathroom has a shower stall, pedestal sink and toilet plus built-in shelves. We are proud to supply Lather brand bamboo lemongrass bath amenities as well as super soft Turkish cotton towels and a hair dryer. 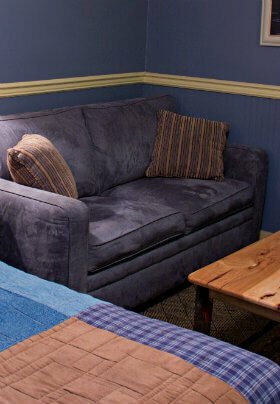 “Hickory Hideaway” (Queen Jacuzzi Cabin #4) is the perfect space for two guests, but it can accommodate up to four by using the full-size sleeper sofa. 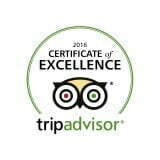 Please note that all prices are based on two guests and extra guests over the age of five will incur an additional $25.00 charge per evening.